Marvel has done it up with its comic books to movies. Now, its time for DC to move past the solid Superman/Batman wall. John Constantine was a good DC taste a few years ago. Swamp Thing was a good taste back in the day. Green Lantern was a start, but where is The Flash movie. There MUST be a flash movie before Justice League. Wonder Woman should be introduced to the public, too. If you have never seen The Flash television program from the 1980's, well what are you doing? That was an excellent one season experiment. You will be shocked at the excellent acting, the ahead if its time special effects and the violent content. It was a drama... without camp! You can purchase it on Amazon.com. I highly recommend it. 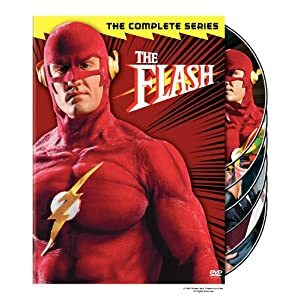 If you want to know what The Flash movie should be based on... look no further than this DVD box set! I can't wait for DC to start pumping out the movies. I only hope they aggressively go after top tier writers and directors. Let us all hope for the best.